London : Crime Club (HarperCollins), (1993). First edition. 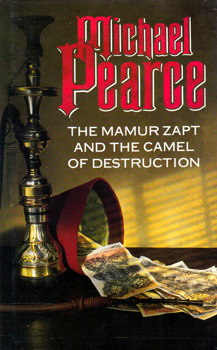 The seventh of the Mamur Zapt series – Cairo in 1910 and a civil servant dies at his desk. Corruption in the air – Gareth Owen, the Mamur Zapt, head of the Cairo Secret Police, investigates, aided by the local barber, the Grand Mufti, the formidable Widow Shawquat, and the monstrous Ali. Demy 8vo (23cm). (190),[ii]pp. 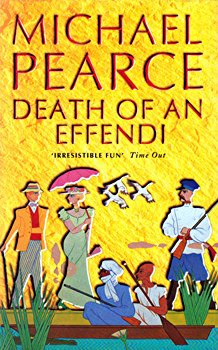 Original red boards, blocked and lettered in gilt; boards lightly marked; some spotting of edges, but a good copy in the Joe Partridge dust-jacket – the jacket just lightly worn, but still very good. 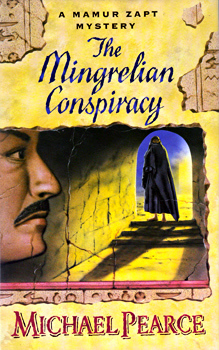 PEARCE, Michael, 1933- : THE MINGRELIAN CONSPIRACY : A MAMUR ZAPT MYSTERY. London : HarperCollins (Collins Crime), (1995). First edition. Gareth Owen, the Mamur Zapt, and a Russian Grand Duke in Cairo in 1908. Demy 8vo (23cm). [iv],(186),[ii]pp. Original red boards, blocked and lettered in gilt; some spotting of edges, but otherwise very good in the original pictorial Richard Duckett dust-jacket – jacket just with a hint of sunning, but also very good. London : HarperCollins (Collins Crime), (1999). First edition. The twelfth in the Mamur Zapt series – shortlisted for the Ellis Peters Award for best historical crime novel. Cairo in 1909, the murder capital of the world, Tvardovsky, an effendi and a foreigner is shot at a gathering of financiers. Gareth Owen investigates. Demy 8vo (23cm). [vi],(180),[vi]pp. Original black boards, blocked and lettered in gilt; edges lightly tanned, but otherwise very good in the original pictorial Colin Hadley dust-jacket – just lightly sunned, but also very good. 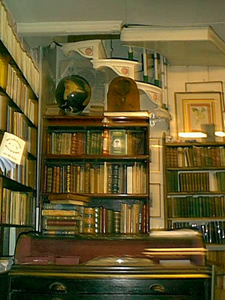 Return to the Crime Fiction index page.